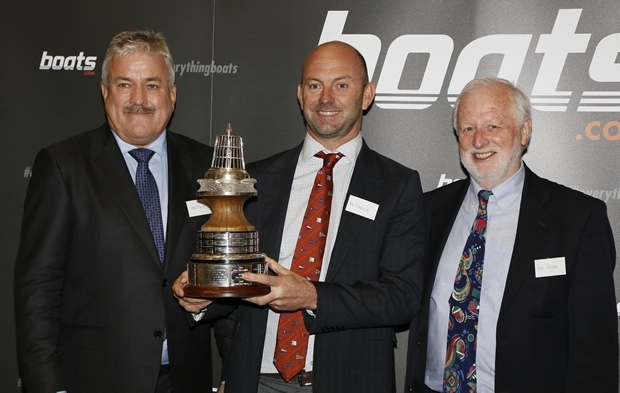 Ian Walker was today named boats.com YJA Yachtsman of the Year by the Yachting Journalists’ Association at a prestigious awards ceremony at London's Trinity House. Eleanor Poole was named boats.com YJA Young Sailor of the Year and famous yachting cartoonist Mike Peyton was presented with a Lifetime Achievement Award. The Yachtsman of the Year Award is one of Britain’s most coveted sporting trophies and 2015 marks its Diamond Jubilee. Previous winners include Sir Robin Knox-Johnston, Dame Ellen MacArthur and Sir Ben Ainslie. It’s regarded by many as 'the knighthood of yachting' and is awarded by the Yachting Journalists’ Association. Ian Walker, from Warsash in Hampshire, became the first British skipper to win the Volvo Ocean Race in the event's 37 year history, when he led Abu Dhabi Ocean Racing to victory in the 2014-15 event. Walker and his team also won the in-port race series and set a 24-hour distance record of 550.82 miles. This performance impressed the UK’s foremost sailing journalists, with YJA members voting him the eventual winner from a closely contested shortlist of nominees that included multiple Match Racing World Champion Ian Williams and Finn Class multiple World Champion and Rio 2016 contender, Giles Scott. The Young Sailor of the Year Award was first awarded in 1993 and recognises endeavour and achievement by Britain’s upcoming young sailors. Eleanor Poole, from Dunsford in Devon, impressed members of the YJA, by garnering a string of firsts to win the 2015 Topper National Championship at the age of 14, as well as securing an impressive seventh at the 2015 Topper World Championship on Lake Garda, Italy. Poole topped a strong shortlist of up-and-coming young talents that included Jack Lewis from Rugby and Cameron Tweedle from Oxfordshire. Mike Peyton, who has been described as ‘The world’s foremost yachting cartoonist’ was named as the recipient of a special YJA Diamond Jubilee Lifetime Achievement Award. Peyton, who celebrated his 95th birthday four days ago, has been a unique commentator on the sailing scene for more than 60 years. His cartoons have been published in scores of magazines from Japan to America, the antipodes and every sailing magazine in Britain. Sponsored by boats.com, the global online resource for boating enthusiasts to explore, discover and research, the awards were presented by Ian Atkins, President of boats.com and Paul Gelder, Chairman of the YJA. Eleanor Poole commented: "It feels fabulous to win the award, just incredible. I wasn’t the favourite to win the nationals but as the event went on I got better and better and it all came together in the end. I love being out on the water and I find the competitive element of sailing very exciting – especially on the start line of a race." Ian Atkins added: “I was delighted to reveal the winners of the boats.com YJA Yachtsman and Young Sailor of the Year awards today. The event marks our second year as sponsors, and we’re pleased to be part of this historic event in its 60th year. As a long-time competitive sailor myself, I feel strongly about being involved in a framework that rewards the most deserving yachtsmen. I'd like to say a huge congratulations to both Ian and Eleanor on behalf of boats.com." Paul Gelder, Chairman of The Yachting Journalists’ Association concluded: "Ian Walker is one of Britain’s most successful sailors and we’re delighted to see his name added to the illustrious winners of our trophy."